The real estate industry is primed for big gains this year, and it’s already realized a lot of them. There are, in fact, several positive indicators that this year will continue to progress. However, increased profit margins will not just fall in the lap of would-be investors. Wealth building opportunities will only present themselves to the proactive. Achieving your real estate business goals in 2017 requires more than persistence and self-discipline; you will need to have a proven system in place. So if you want to achieve your real estate business goals this year, look no further. You have come to the right place. Whether or not you are where you want to be in the real estate investing industry, it is imperative to implement proven systems; perhaps you prefer to call them real estate business goals. Not only will a planned approach to investing facilitate a smoother business model, it will also permit you to replicate success. With that being said, you must have a written business plan that establishes clear-cut priorities based upon profits, not just revenue. For your benefit, we have highlighted four particular strategies that are designed to help you meet and even exceed your real estate business goals. Follow these guidelines to make your real estate business more profitable. As a real estate investor, your first priority is profitability. After all, it is most likely the number one reason you began investing in the first place. Dedicate time to review your businesses production over the last year. Identify the three lead generation activities that resulted in the greatest amount of revenue for your business, as well as the expenses associated with that income. In other words, which activities resulted in the most profits after costs were accounted for? Conversely, it is generally a good idea to know which activities are falling short of their goals. If these particular activities are suffocating funds that can be better spent elsewhere, it is time to consider allocating them. Being willing to let go of your least profitable activities allows you to have more funds to grow the most profitable aspects of your business. Investors, young and old, are typically busy individuals. As an entrepreneur, your business relies on your participation. The very nature of this industry requires a driven individual that can keep up with multiple tasks. However, many may be unaware that the order in which you handle these tasks can make a huge difference in efficiency. Investors are advised to tackle their toughest “to do” items first. This will prevent procrastination from impeding on your progress. Moreover, each time we procrastinate, that particular item on your “to do” list becomes that much more difficult. Thus, always complete your highest priority goals at the beginning of the day. Any amount of delay greatly increases the energy and effort it will take to achieve later. This practice holds particularly true for your most profitable activities. Commit to completing your most profitable tasks first and you will be rewarded accordingly. Some people find that they are more effective in achieving goals when they have no emotional charge around achieving the goal. Slow, steady and calm works best for them. Others need the adrenaline and the pressure of a deadline. Each person is different — identify the strategy that works for you and use it. There is absolutely no shame in rewarding yourself for accomplishments, no matter how big they are. Celebrate all wins. Every action you take as a real estate investor occurs within the confines of your environment. For example; some people may enjoy working in a noisy environment, while others prefer a more tranquil atmosphere. If you find yourself consistently being distracted when you’re working, change your physical environment. If the office is a distraction, work at home. You may even need to leave the comforts of your own home to move to an office setting. Take note of where you are the most efficient and spend your time in an environment that is more conducive to your success. 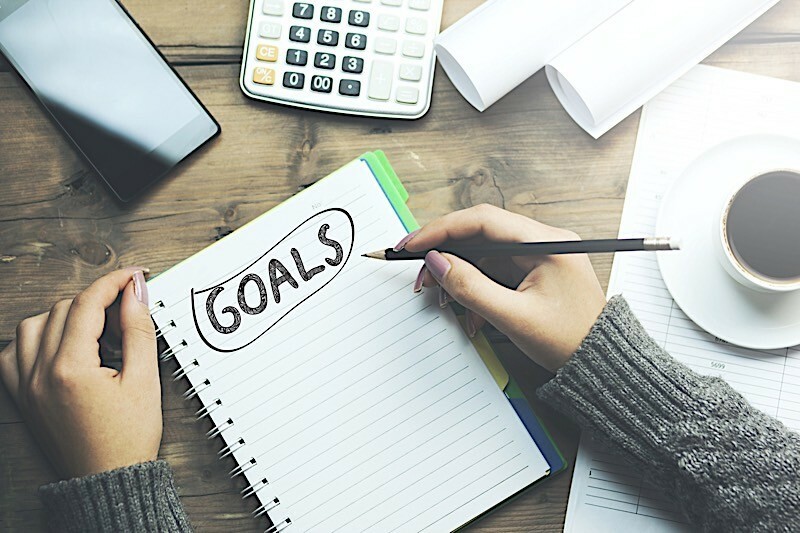 While relatively simple, these real estate business goals can have a significant impact on the success of your career. Taken seriously, they may be just what you need to get to the next level.